Crystalfontz, located in Valleyford, WA. designs, manufactures and sells high quality LCD modules directly. Their in house design & manufacturing can take your concept and produce a high quality product using ISO 900x certified standards. Including writing firmware and test software in house. Crystalfontz produces several styles of LCD displays, from 1 line text only to Graphic’s capable LCD’s, with several choices of backlighting colors to choose from. The Crystalfontz Model 632 USB LCD we’re looking at today is a 16 x 2 text only Liquid Crystal Display with the standard lime green backlighting. It is housed in a 5 ¼” drive bracket with a black faceplate (brushed aluminum is also available). The 16 x 2 denotes that it’s capable of 16 characters on each of 2 lines. This should be more than enough for most applications. You can modify some of the characters using software freely downloaded from the Chrystalfontz web site (more on this later). 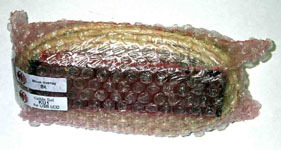 The photo below shows how it arrived from HighSpeed PC, completely wrapped in bubble wrap. I was a little surprised at this, but the wrapping proved to be quite ample! The below photos show how the display was further protected by another sheet of bubble wrap and a paper “sticky” to protect the faceplate and LCD screen. Inside the bubble wrap bag was the LCD (already mounted on the 5 1/4” drive bracket), the USB power/data cable and four screws. The steel bracket shown in the photo below left is quite hefty and provides a very solid base for the PCB/LCD unit. 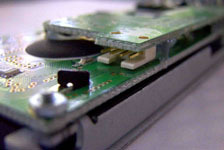 Although this is the USB version, it still has the serial port connector and the next two photos show the added PCB board to make the necessary USB power/data connections. The fit & finish, shown in the below left photo, is exceptional. The faceplate has a slight granular texture with a semi gloss finish. Installation was easy and straightforward, simply plug in the power/data end of the USB cable (center photo), into the Crystalfontz, route the cable through the case and install the unit in an open 5 ¼” drive bay either directly or with drive rails (depending on your case). The ONLY caveat to this unit is that there is no bracket to lead the cable to an external USB port. I chose to drill a hole on the back of my case (below right photo), so I could plug the other end into an open USB port. This unit does not come with any software, but it’s free to download from the Crystalfontz web site (along with other related programs). I downloaded the Crystal Control program and the Crystalfontz Boot Screen program. 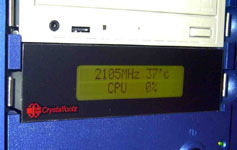 When I first powered up the unit in Windows XP Pro, the OS readily identified a new USB device, and correctly showed it as a Crystalfontz unit. However, after installing the Crystal Control program, I still could not access the unit. After locating the USB drivers on Crystalfontz web site, I downloaded and installed them, rebooted and brought the LCD to life. 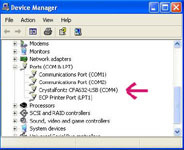 Now, all you need to do is go into the Crystal Control program and setup the unit to receive the programming. But first, to keep from playing a guessing game as to what com port (Interface type) to set, I suggest going into Device Manager, photo below left, and find out what port the OS has assigned it. This will ease your setup woes. Armed with this info, you are prepared to enter the Module Configuration program, photo below right, and select your LCD type (Crystalfontz 632). Select the Interface type and speed. Set the Character Contrast to 75 and the Backlight Brightness to 100. Test the settings by clicking on the Test Settings button. If you receive an error message, go back and check your settings. If everything is OK, click on OK. This takes you back to the LCD settings control box.